TheRustedChain - The Blog: Falling. It seems like the weather knew the exact minute the calendar said it was Fall. Everything changed overnight and now we're smack in the midst of Fall. I love the colors. The sounds. Love candy corn. Have you ever tried candy corn with peanuts mixed together? Delish. when i drove home from work...it was 107.
i just want to wear a sweater....and not sweat. I love the candy pumpkins this time of year. Can't wait for cooler weather either! It's still in the upper 80/lower 90's here. We don't have distinct seasons. I buy candy solely to use in photos, too. Can't eat it, so might as well do something constructive with it! Thank heavens my co-workers don't have qualms about devouring my "models" when I get done with them! i love fall too! growing up in southern california we didn't really have fun so i've LOVED the last two falls i've gotten to experience here. except for candy corn. yuck. I had no idea that Gummy Candy Corn existed, cool! I so wish it felt like fall here....Instead, it's hotter than H-E-double hockey sticks, and totally killing the fall vibe. At least I can live vicariously through you, and your candy corn. I love everything about fall, I just wish we got more of it down here! Ah, yes, I can say we are feeling Fall here just a little but it's still been around 65-70 degrees during the day. My flower baskets are still looking spectacular so I'm not quite ready to pitch them and go all out for Fall decorating just yet. Enjoy, when I lived in Kansas, Fall was THE best season! It's still hot as heck over here, but my house is filled with everything Fall. I don't think California got the memo that it is now Fall. It has been in the 100's all week. yuck!! I also LOVE Fall, but it doesnt really become Fall in Cali until October. And, have you tried Caramel Candy Corn? It is AMAZING!!! I wrote about it on my blog last year! 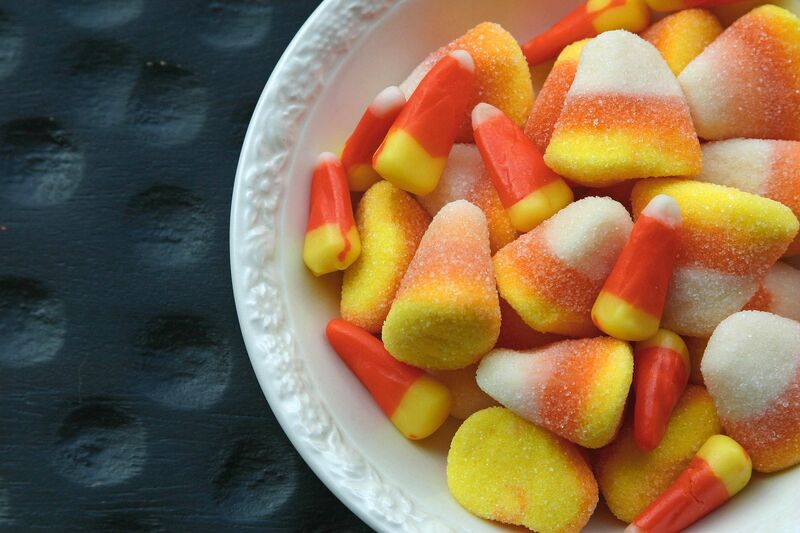 It is WAY better than normal candy corn! I love the fall too! I'm dying to pull out all the autumnal decorations and go to town with the pumpkins and autumn leaves. Unfortunately, it's been in the 90's all week! Candy corn! Get in my belly! Fall is my absolute favorite! In the back of my mind Im throwing a fit, cuz I now winter is just around the corner. now we just need the grocers to get in their canned pumpkin stock. i had to buy a boxed pumpkin bread mix yesterday. oh, the horror. Yummy! I've never seen gummy candy corn. I bet it's good. I think anything would be good right now...haven't had sugar for 2 weeks!! I blogged about you...kinda. Thanks for the permission to decorate! ohhh, now i want candy corn....scratch that..... i NEED candy corn! I fell for Fall years ago and I'm afraid it's a love affair to last a lifetime. I'm so lucky now to live out of the desert so I can actually experience all the best parts. I'm wanting that gummy candy corn! I had no idea they made it and it looks so good! I thought the same thing this year...I live in Dallas, which some people will tell you is hot, or hotter. And they are nuts. Anyway...in my son's class they had to find out the exact time that fall started (for the northern hemisphere). We found out it was 5:18 on the 22nd, and from that evening on it has been cool as can be here. I thought it was so funny, and otherwise wouldn't have known except for his little assignment that fall had officially started. ah fall... Christmas isn't the only "most wonderful time of the year"! I did not know there was gummy candy corn - I'll have to keep an eye out for that! They're so cute! You've put it so perfectly! I want to know where you found the gummy candy corn. I WANT SOME!! I looked at Walmart and couldn't find any. WHERE WHERE????? That is so sweet about the boy :) wanting to donate his money! What a sweet boy! OH, I will have to find some gummy candy corn bc I love CANDY CORN! YUMMY to my TUMMY!